This 1967 photo shows the OMEGA which trains astronauts in zero-g on a horizontal plane. In this historical photo from the U.S. space agency, OMEGA (One-Man Extravehicular Gimbal Arrangement) shown here permits unlimited freedom, and was designed around a parallel pair of 32-inch-diameter thin-line angular-contact bearings with half the balls removed to minimize friction. 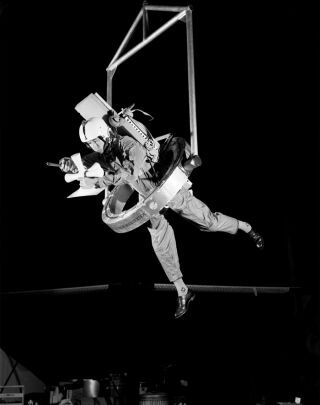 Tests have been conducted with OMEGA subjects in flight suits and pressure suits to determine the best gimbal restraint system and operation techniques. The test subjects are suspended in a sling support from a single RDS cable. As they translate about, the RDS tracks them, keeping the cable vertical. The test subjects operate in an effectively zero-g environment in the horizontal plane.